One Success Story at a Time"
1 YEAR FREE MEMBERSHIP TO InterNACHI, A $500.00 SAVINGS! Thank you for visiting the HomeSpection® Training Institute. Please visit each page by clicking on each of the tabs above or at the bottom of each page, from "About Us", "FAQs" and down to our "Testimonials" page. Our site is very informative, and will answer all of your questions and explain what all we do for our students that NO other school in our profession does. 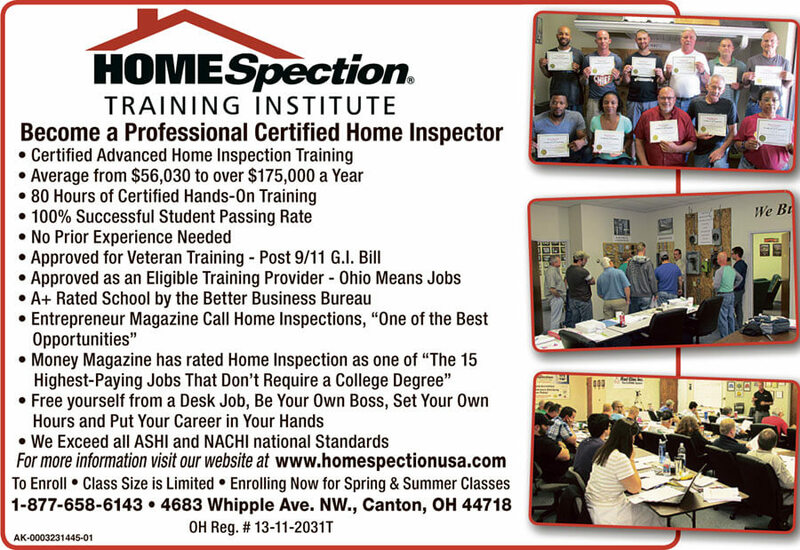 Since 2004, HomeSpection® Training Institute has offered world-class, home inspection training from one of the best instructors in the industry at our hands-on training facility in Canton, OH. We have been one of the country's premier Home Inspection Schools due to our total "Hands-On Training", 7 day 24-hour support and our 100% success rate with every student passing the final exam! If you'd like more information about our classes, affordable tuition, or our upcoming schedule please visit the "About Us" and the "School Enrollment" tabs. "Hands-On Training and Live 24/7 Support"
In our pre-licensing Advanced Home Inspection Training Course you are trained by an instructor with over 42 years of experience in the field as a Certified Master Home Inspector and as a college level instructor in this profession. A Certified Master Inspector will be mentoring you, both during and after training, as you perform real home inspections in the field, finding all defects in the home, and showing you how to properly write inspection reports using the software. This course meets the pre-licensing requirements for Ohio, as well as many other states that require Home Inspectors to be licensed. Upon graduation, students will have a thorough knowledge in all aspects of the home inspection industry and be well-prepared to seek employment as a Licensed or Certified Home Inspector or to start their very own Home Inspection business out of the comfort of their home. We prepare students looking to start their own business by training them in business start-up, marketing, and providing on-going live support directly from their instructor. Our students receive live, seven day, 24-hour support that is good for life with no extra fees. Most schools charge their students for online or blog support, meaning you may have to wait days to get the answers you need. HomeSpection® also provides our students with everything they will need to be successful; we buy all your books and class materials, all the inspection tools you will need to perform a General Home Inspection, you get a 1 year free membership to InterNACHI, ($500.00 savings) and the best live support in the industry right from your instructor. The "Hands-On" training you receive includes inspecting your first six homes out in the field, being trained on the report writing software while here in class, as well as an additional 24 hours of field inspection and software training doing your four practice property inspections. You've probably seen us in national magazines, newspapers, commercials, on the internet or maybe you have spoken with one of our successful Certified Home Inspectors. Most visit our site due to disliking their jobs, being laid off or getting sick of jobs that go nowhere year after year. Being a Licensed or Certified Home Inspector is one of the most rewarding professional careers as reported by Entrepreneur Magazine and Money Magazine. In 2016 the US Bureau of Labor Statistics reported that home inspectors can make $56,040 to $88,830 a year! However, many of our students service multiple counties, with some making well over $175,000 a year! In addition to our Advanced Home Inspection Course, we also offer a Radon Measurement & Testing Course, a Certified Microbial Assessment Training Course, and a Radon Mitigation Training Course. The Advanced Home Inspection course provides total "Hands-On" training in the classroom and out in the field and goes into more detail than the typical Basic Home Inspection courses. Through our total "Hands On" training in the classroom and out in the field, we enhance the student's understanding in the following areas: Roofing, Plumbing, Structural, Environmental Issues, Grounds and Drainage, Foundations, HVAC, Air Conditioning Systems, Heating Systems, Water Quality, Water Flow, Biological Agents, Allergens, Asbestos, Wood Eating Pest, Insulation, Ventilation, Interior, Exterior, and Electrical. During training, our students inspect their first two homes out in the field, and then are trained on the report writing software how to prepare a General Home Inspection (GHI) Report. We also train our students in marketing and business promotion, providing them with the skills to build their own successful business if they choose. We are now enrolling for 2019 Spring & Summer Classes starting on Monday May 6th (One seat left! ), Monday June 3rd (Two seats left! ), and Monday July 8th (Call for availability). The pre-licensing Radon Measurement & Testing Course is designed to give students a thorough knowledge of the science of Radon, Radioactive Decay, types of radiation, health risks of radon, how radon enters and moves through buildings and homes, as well as the different types of measurement devices. 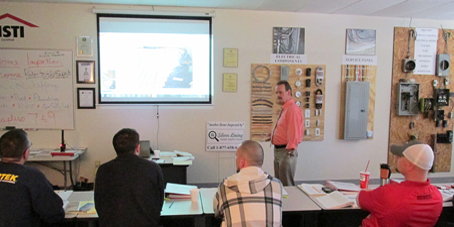 Students are also trained on the importance of developing and using a Quality Assurance/Quality Control Plan. 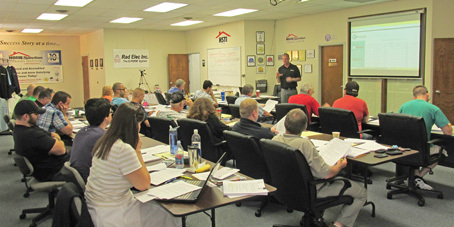 This two day, 16 hour course is required by the Ohio Department of Health as a prerequisite to obtaining your Radon Testing license and we are nationally approved as one of the few schools in the country and the only school in Ohio by the National Radon Safety Board (NRSB) and the National Radon Proficiency Program (NRPP). This course meets the pre-licensing requirements for Ohio and any state that licenses Radon Testers. Our 2018 classes have been averaging over 93% passing rate! We are currently enrolling for classes on April 24th & 25th (One seat left!) and May 22nd & 23rd (Six seats left!). Our Certified Microbial (Mold) Assessment Training Course is designed to give home inspectors a basic understanding of microbial contamination and the equipment used during an assessment. Students will learn how to recognize the presence of microbial contamination, how to collect samples for laboratory analysis, and provide the basic understanding of how to interpret laboratory results. 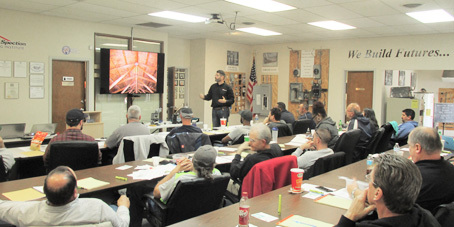 The class will focus heavily on Construction Science and how construction techniques create elevated moisture conditions. After taking this class, you will look at a home differently because you will learn that microbial contamination is only a symptom, and moisture is really the problem. This is a one day, eight hour course, and we are currently enrolling for our class on Friday June 21st (Seven seats left!). 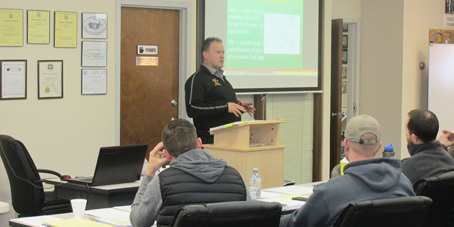 Our pre-licensing Radon Mitigation Training Course is a three day, 24-hour, course that is taught hands-on both in the classroom and out in the field installing a radon mitigation system. This course covers indoor air quality diagnostic testing, the design, installation, and troubleshooting of radon mitigation systems, worker health and safety, radon in water, ,and preventing radon in new homes. After completing this course students will be able to install a radon mitigation system. This is an essential course for home builders and inspectors, HVAC and plumbing contractors, environmental consultants, indoor air quality professionals, public health officials, and nonprofit health advocacy organizations. If you are looking to get licensed by the Ohio Department of Health as a Radon Mitigation Specialist you must first complete the Radon Measurement Course. Our Radon Mitigation Course has been approved by the Ohio Department of Health and the National Radon Safety Board (NRSB). 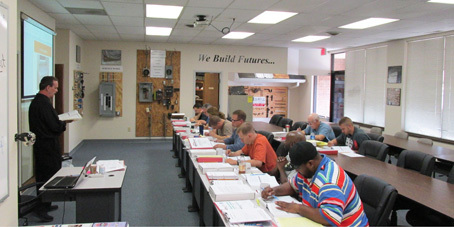 We are currently enrolling for our June 28th - 30th Radon Mitigation Training Course (14 seats left!). We are an Accredited School with The Better Business Bureau® since 2012 and have always had an A+ rating. In fact, we have NEVER had one complaint! Our reputation, testimonials, and our students' 100% successful passing rate prove this. We are very proud of the fact that 100% of our students passed the Certified Home Inspectors final exam on their FIRST try. Again, we contribute this to our total "Hands-On" Training in the classroom and out in the field, and our Instructor's 42 years of experience as a Certified Master Inspector! Approved by the State of Ohio as an Eligible Training Provider and accepts funding through the Ohio Department of Job & Family Services, Ohio Means Jobs, and the Workforce Innovation & Opportunity Act (WIOA). Approved by the State of Pennsylvania as an Eligible Training Provider for PA Career Link and Job & Family Services, and the Workforce Innovation and Opportunity Act (WIOA). Approved by the State of Michigan as an Eligible Training Provider for Michigan Works! and Michigan Training Connect. Approved by the Indiana Professional Licensing Agency as a Pre-Licensing Course Provider for Home Inspectors in Indiana (CE217000013). Approved by the West Virginia State Fire Commission as a 80-hour Pre-Licensing Home Inspection Course Provider for West Virginia. Approved by WorkForce West Virginia as an Eligible Training Provider for WIOA (Workforce Innovation & Opportunity Act) Funding. Approved for Veterans Training and now accepting Veteran Benefits & Post 9/11 G.I. Bill. An Eligible Training Provider for the Trade Adjustment Assistance (TAA) Program which provides trade affected workers with financial assistance to get you back to work. Approved and licensed by the Ohio State Board of Career Colleges and Schools (Registration No. 13-11-2031T). Approved by the International Association of Certified Home Inspectors as an InterNACHI Education School Provider. Approved Provider and School for the Ohio Bureau of Worker's Compensation (Provider No. 203914782-00). Approved and by the State of Ohio Department of Health as a Pre-Licensing Training Provider for our Radon Measurement & Testing Course (Licensed Number TR11) and our Radon Mitigation Training Course (License Number TR7). Approved by the National Radon Safety Board (NRSB) as a Training Provider for Radon Measurement and Radon Mitigation. Approved and licensed by the Ohio State Board of Career Colleges and Schools (Registration No. 13-11-2031T) as a Training Provider for our Certified Microbial (Mold) Assessment Training Course. Approved and proud member of the OMACCS, Ohio-Michigan Association of Career Colleges and Schools. 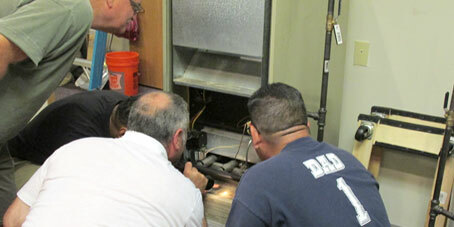 We are the ONLY school in the country that provides our students with total "Hands On" Training in the classroom and out in the field covering every component of the home, from the HVAC SYSTEMS, PLUMBING SYSTEMS, HEATING SYSTEMS, COMBINATION SYSTEMS, AIR CONDITIONING SYSTEMS, ELECTRICAL SYSTEMS, STRUCTURAL, INTERIOR, EXTERIOR, WATER QUALITY AND FLOW, BIOLOGICAL AGENTS, ALLERGENS, ASBESTOS, WOOD EATING PEST, GROUNDS & DRAINAGE, INSULATION, FOUNDATION, including FIRE, SAFETY, RADON, MOLD, ENVIRONMENTAL ISSUES and HEALTH. 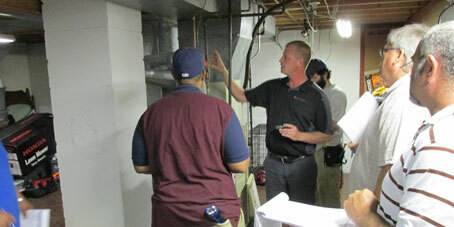 Some ENVIRONMENTAL ISSUES such as MOLD and RADON require additional certification or license training. 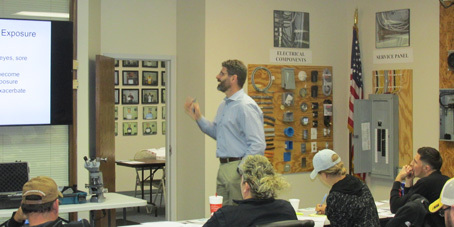 Your "Hands-On" training includes inspecting your very first two homes while in class. As part of our 80 hour Advanced Certification course you will also complete 24 hours of field study inspecting four practice properties, completing your written and GHI reports and reviewing them with us in detail. We feel these opportunities set us apart from other schools! Can you imagine learning the trades of Carpentry, Plumbing, Electrical, and HVAC without hands on training? We can't either! It reminds us of someone going to a home improvement store and buying a book on Plumbing...we all know the results of that job! We have combined a successful 80 hour Advanced Certification Course that not only meets, but exceeds all NACHI, ASHI, InterNACHI and CAHPI standards of practice. We also provide additional valuable instruction that makes our school unique in this industry. You are trained by a Certified Master Home Inspector with over 41 years of Residential and Commercial Inspections, Construction and College Faculty Instruction experience. 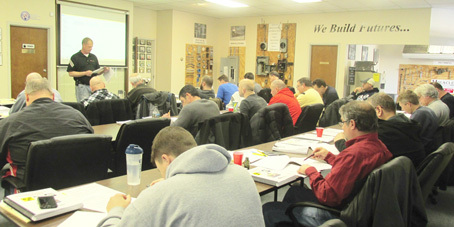 Over our years we have trained and Certified TRUCK DRIVERS, PLANT MANAGERS, CLAIM ADJUSTERS, AVIATION INSPECTORS, AVIATION MECHANICS, PILOTS, PEST INSPECTORS, PROPERTY MANAGERS, PROGRAMMERS, SECRETARIES, MACHINISTS, FARMERS, FABRICATORS, DRAFTSMEN, AIRLINE PILOTS, WELDERS, BUILDERS, CONTRACTORS, ELECTRICIANS, PLUMBERS, TREE CUTTER, TOOL & DIE MAKERS, MACHINIST,HVAC EXPERTS, CARPENTERS, PAINTERS, POSTAL WORKERS, JANITORS, BARBERS, LANDSCAPERS, HEAVY EQUIPMENT OPERATORS, PAVERS, ROOFERS, MASONS, CHIMNEY SWEEPERS, DEFENSE WORKERS, CODE BROKERS, MUSICIANS, INSPECTORS, TRAFFIC CONTROLLERS, POWER LINE WORKERS, BUSINESS OWNERS, BANKERS, PROFESSIONAL BOXERS, SALESMEN, INSURANCE AGENTS, D.O.T. WORKERS, CARPET INSTALLERS, WINDOW INSTALLERS, CONCRETE INSTALLERS, DRYWALL HANGERS, INSULATION INSTALLERS, CABLE WORKERS, OHIO WORKERS COMPENSATION REHAB CLIENTS, RETIRED WORKERS, REAL ESTATE AGENTS, PIPE FITTERS, REAL ESTATE INVESTORS, POLICE OFFICERS, CLERGYMEN, MISSIONARIES, X-RAY TECHNICIANS, COMPUTER TECHNICIANS, TEACHERS, STNAs, FIREMEN, PHARMACISTS, SOCIAL WORKERS, EMTs, NURSES, UNITED STATES ARMY RANGER (SNIPER) and numerous husband and wife teams, father and son teams including mother and daughter teams. A Home Inspection Career lets you, FREE YOURSELF FROM A DESK JOB, BE YOUR OWN BOSS, MAKE YOUR OWN HOURS and PUT YOUR CAREER IN YOUR HANDS. According to The United States Department of Labor and the Bureau of Labor Statistics, home inspection jobs in 2008 were 106,400. The number of jobs expected by 2018 are 124,200...almost 20% growth. In 2016 the US Bureau of Labor Statistics reported average salaries currently range from $56,040 to $88,830 or higher depending on how large of a territory you may want to service. We have students that are now making over $175,000 a year. Money Magazine has rated Home Inspection as one of "The 15 Highest-Paying Jobs That Don't Require a College Degree" - Money Magazine, Sept 11, 2014. Entrepreneur Magazine ranks Home Inspection as "One Of The Best Opportunities" - Entrepreneur Magazine, Oct 22, 2001. ASHI and the National Association of Realtors recent study shows that nearly 4.9 million home inspections were performed alone just in 2000 and 97% of home buyers believe that the home inspection was a good value for the price they paid. 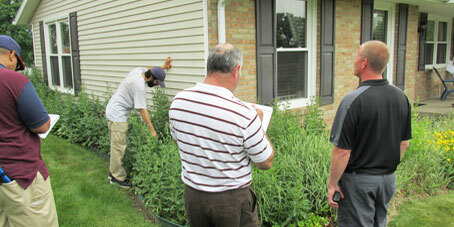 The shortage continues for professional Certified Home Inspectors. In 2015 the U.S. Department of Housing and Urban Development reported that new construction is up 23.6% from the same time in 2011. Cleveland.com reported U.S. sales are up 25.8% over the same time period. The Akron Beacon Journal's business writer Katie Byard wrote on January 20, 2013 that the U.S. continues to climb in home sales due to the lowest mortgage rates ever recorded, the housing sales in Northeast Ohio are doing at least as well. Summit County Ohio had a 38% increase in sales over the same period in 2011. Ms. Byard aslo notes that Steve Golstein from Market Watch reported that U.S. home sales are the BEST in 5 years. The Associated Press in Washington D.C just reported Sales rose 21% in 2012. Bloomberg reported on May 28, 2013 that "Consumer confidence climbed to the highest level in more than five years and home prices advanced by the most in seven." On January 20, 2013, Katie Byard from the Akron Beacon Journal reported, "Real Estate Market Stirring to Life" and was up 20% from 2010. CNN Money's Emily Fox reported on July 24, 2013, "New Homes jumped to a five year high. Sales were 38% higher from the same period last year" and that "It was the highest pace of sales since May of 2008". The Associated Press reported on July 25, 2013 that the markets have risen 38% in the last twelve months. That's the biggest jump since 1992. As reported by Katie Byard from the Akron Beacon Journal on August 22, 2013, July figures or sales highest in 6 years with Ohio surging 25.8% and nationwide sales are 17.2% higher. US sales surge in 2013. 2014 might be the best year ever in Real estate. This information is provided by The National Association of Realtors. Katie Byard from the Akron Beacon Journal also reported on October 24, 2014 Summit County homes sales reached their highest level for any September since 2006 as sales also climbed statewide. Homes sales are bouncing back nationwide with homes changing hands at the fastest clip this year. Nationwide, all regions saw gains in homes sales, according to the National Association of Realtors. The National Association of Realtors stated on May 6, 2015 that the national home sales index climbed 11.1 percent and signed contracts are at their highest levels since June of 2013. Americans rushed to buy homes with 2015 marking the strongest year in the housing market since 2007. Also new homes accelerated sharply in 2015, rising 14.5 percent. The story was in the Akron Beacon Journal on 1/28/2016 and was compiled from staff and wire reports. U.S. home sales rebound. This article was in the Akron Beacon Journal on 10/21/2016 compiled from staff and wire reports. The National Association of Realtors said that sales of existing homes rose to a seasonally adjusted annual rate of 5.37 million, the strongest pace since June. Demand for homes is solid. Americans bought homes in October at the fastest pace in nearly a decade. Sales reached their strongest pace since 2007. This article was in the Akron Beacon Journal on 11/23/16 compiled from staff and wire reports including the National Association of Realtors. The National Association of Realtors has just released a report calling 2016 the best year in a decade for existing home sales. The year finished at 5.45 million sales; the highest level since 2006. This article was in the Akron Beacon Journal on 1/28/2017 by Francesca Stygar in the House & Home Magazine. New home sales climbing. Americans bought more new homes in January. The housing market is healthy despite higher mortgage rates. New homes sales rose 3.7 percent to a seasonally adjusted 555,000, the Commerce Department said Friday. This article was in the Akron Beacon Journal on 2/25/17 in Your Business section. More New Homes Being Built. The National Association of Realtors said on Wednesday March 29, 2017 that its pending homes sales index climbed 5.5 percent in February to 112.3, its highest point since April and its second -highest point since 2006. This article was in the Akron Beacon Journal on 3/30/17 in Your Business section. The HomeSpection® Training Institute not only gives you a superb Certified Training program, we also train and advise you on starting up your very own Home Inspection Business out of the comfort of your very own home FREE of charge. This includes training you on report writing skills with the latest 400 point digital software in our industry. 20% of our students decide to work for Private Companies, or City, County, or State municipalities including Federal Agencies such as FEMA. You may also decide to work for Real Estate Agents, Realtors, Appraisal Companies, Property Management Companies, Insurance Companies, Title Companies, Sheriff Sales, Investors, Architects, Builders, Financial Institutions, Bank Foreclosures, and Auctioneers just to mention a few. Our student's Testimonials say it all!